A lot of you may feel, why should you care about this project. Today, I wanted to share some things on why STEEM MARINES is going to definitely add value to STEEM. When it comes down to the golden rule, or golden question, "Do you add Value to Steem" I'm pretty sure every single one of us can give you a long list of reasons why our content adds value. Now, I have constantly looked for ways to add value to steemit. Some of them good successes, some not so great. But one thing is very clear at the end of the day, no one cares. And that's okay! In fact, I'm hyped for being able to get this far, and try new things. That's what STEEM MARINES are for me. My latest new thing. Seeing as I'm still in the support gathering stage, let's get into 5 reasons STEEM MARINES will help Steem. We're not advertising steemit. But STEEM. We want to make everyone aware of why STEEM is awesome. By incorporating STEEM into the lore and the heraldry of the STEEM MARINES, we're taking every single model and representing the STEEM Ecosystem. 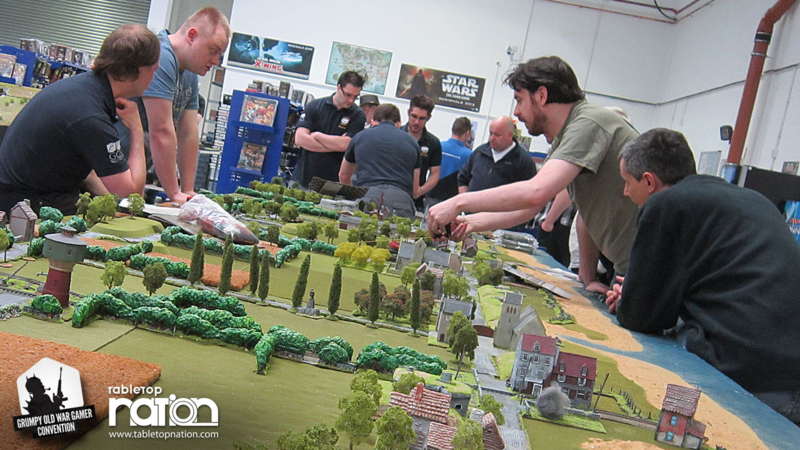 So, when we're out there in locale stores with a high quality painted army and someone asks "What is that army about"
We will tell them about Steem! When we kick our opponents asses and come out 1st place, WE WILL TELL THEM ABOUT STEEM. When people look at our painting videos on youtube/dtube, WE WILL TELL THEM ABOUT STEEM. 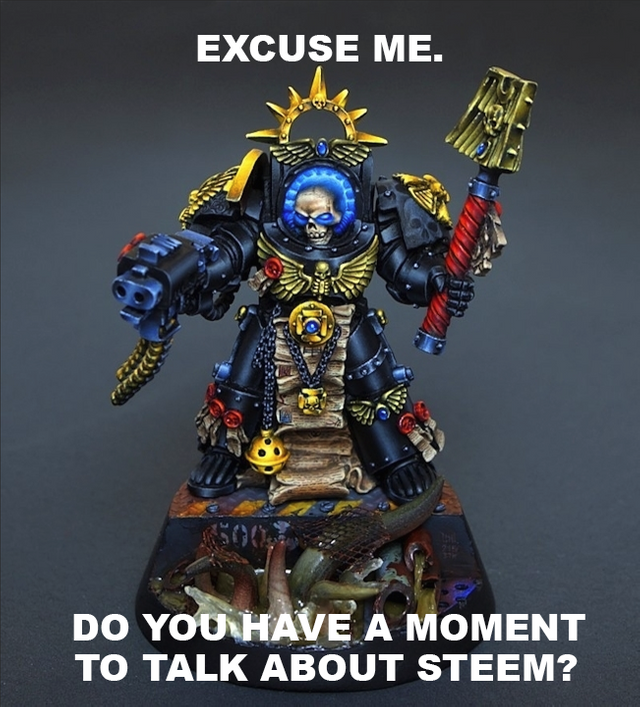 When people go to their search engine and google "Custom Space Marines" WE WILL TELL THEM ABOUT STEEM. When people sign up and see this as a trending post, WE WILL TELL THEM ABOUT STEEM. Speaking of advertisements. 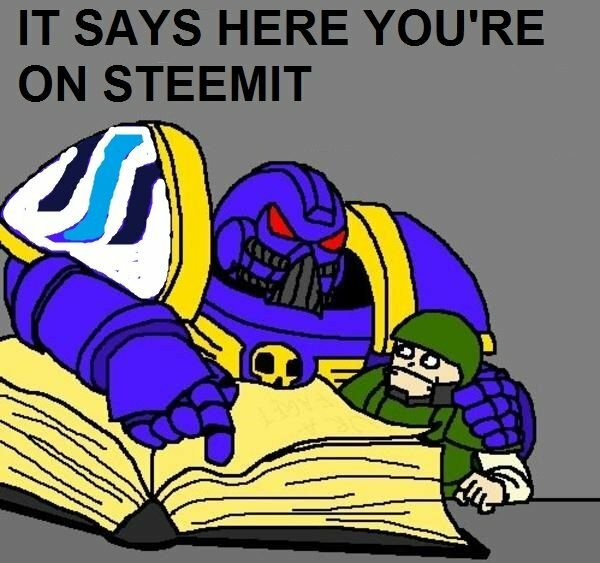 I'd actually like to talk about the demography of the STEEM MARINES. I know you're getting tired of seeing STEEM MARINES in all caps, but it's important to know we're talking about the STEEM MARINES and not the STEEMIT MARINES. They're most likely going to be tech savy, or have some if not entry level into tech. So they're probably going to understand what cryptocurrencies are. Some may even have a background in coding. These people are going to be typically well established, with a high probability of having higher education and careers. They are going to be calm and collected, friendly and knowledgeable. These are people who have a strong sense of community and loyalty, with strong principles. These are definitely people we want to be onboarding to the platform and exposing steem to. I think that the community, in general, can benefit greatly. Just like it can definitely be an opportunity for these potential users, as Steem has an excellent ecosystem. I base this evaluation on about 2 years of running a Warhammer 40k discord server with about 600+ members, another 2 on Reddit, and about half of my life time going to hobby shops and socializing with other hobby enthusiasts. Right now, It's not quite inspiring, I'm aware. We haven't even gotten some of the things we're going to need yet. But there will be a time where I will start producing the real content. People will take a look at what I'm doing, and be inspired to do their own content lines, or find ways to put out genuinely interesting or beneficial content. Showcasing how the Steemit platform can reward engaging and interesting content is just going to hype people up to try harder. To reach the production quality that I'm imagining, we're going to need a collection of talent. Instead of offering post equity, which I think is immoral and speculative. I instead want to commission people of steemit to fill out things that we're going to need. Such as video editing and motion graphics, character design and concept art, Creative writers. To get this project where it needs to be, I will be hiring within the Steem ecosystem. Creating opportunities for people on the inside, and making the ecosystem that much healthier. We already know that Steem benefits from having different communities and gatherings. Communities are gathering points of socializing. Nothing breeds oppurtunities better than people talking to people. Like-minded individuals talking and pooling ideas together to one day make their own contributions. We see this in PAL and Steemspeak, I'm sure that they are a few more. But the idea is to grow and expand the ecosystem, spreading out and creating new places for ideas to grow. The Steem Marine discord is such a place, where people will be able to gather and influence content, but most of all socialize with each other. And we all have one thing in common. Want to become apart of this? This is where the magic will be happening. Votes, news, content updates, exclusives will all be available at this discord server. Everyone is welcome to join, but keep note that this will not be a channel to spam posts in. This is very much a work in progress, but I have a very general idea of what it will all look like. Everyday I'm hard at work laying the foundation of what could possibly be one of the coolest things that steemit has ever seen. Dialogue is completely open, share your opinions, what you think should happen, what I could do, anything. I will reply to your comments. The is one thing that I'm really looking for feedback. We'll see how good my 3D modelling skills become (and if I can get my hands on a computer with the capability to run Fusion360 and more haut-de-gamme modelling tools XD). Ahhhh, I actually had no idea the scope was this large and was a means to expose outside viewers to Steem. I was already 100% but now I'm 10,000,000% in! I'm a nerd. This is nerd cool. I am very much in agreement. Nerd cool plus ten. Stick around man, you might find this stuff mind blowing! So instead of a techpriest you'll be a steempriest for the adeptus blockchainius then? I want the community to be the army, I want the large supporters to be the command figures in this army. This is fantastic! STEEM MARINES! I would like to invite this concept and niche into a community we are trying to grow #MinnowMilitia I would like to provide a specific space you can network with other steemians interested in this concept. @malicered together we can conquer. It is about making you think from a different perspective.. It is about writing without any expectations of UPVOTES.. Excellent post good analyses thanks for sharing. I got pretty excited when I read the headline, we may very well want to form our own decentralized paramilitary force. I'm in! 100% upvote and following you now! Why is Discord being used for discussion instead of SteemIt or SteemChat? Hey there, I fixed it. Just got back now. Thanks for letting me know! it is altogether informative publish then i want in conformity with be aware of more respecting Steam durability. Thank you very much sir !! I am agree with your opinion and I mean steemians got very enjoy by informative blog,video,music. I am self-teaching to code and program. I WISH I was already there, but alas, I need to sleep sometimes in between work stuff and kids and other commitments. Want to contribute to this so badly. In the meantime, I will be following development and can't wait to see where this goes. Your ideas are excellent, I'm totally in! The link in the beginning redirects back to this post. I guess you tried linking to this one: https://steemit.com/steem/@malicered/steem-marines-everything-you-need-to-know. By any means it's the strangest STEEM it support project I've met since I joined back in June, 2017... but it's also the COOLEST one! I would have missed it if @aggroed didn't re-steemed it on his wall. I'd say I'm a level 1 a board and RPG game fan. Would be cool if one day I test my skills with the STEEM Marines on the Warhammer 40k map. Damn, I admire your enthusiasm. Resteemed. I would be totally on board if it weren’t for the totally uneccessary Nazi-chic logo. 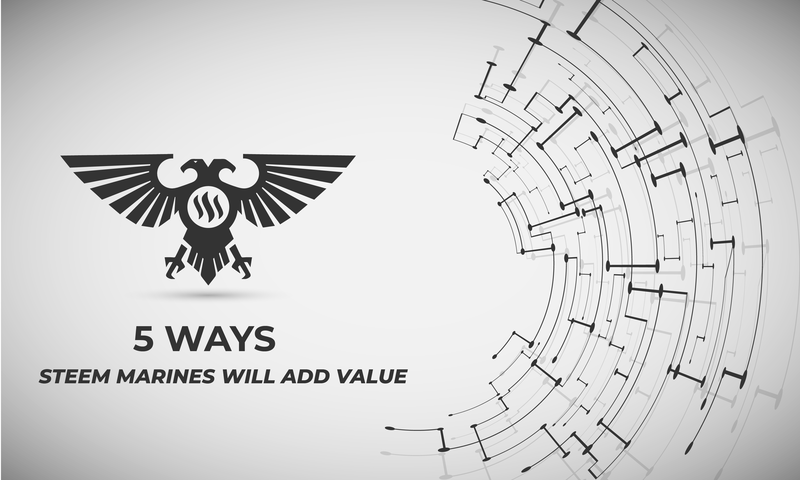 The logo is based on a standard Marine logo in the Warhammer40K universe. An eagle is a symbol of power used by America long before the murderous psychos used it to decorate their propaganda. Thank you @budgets for making a transfer to me for an upvote of 59.09% on this post! Half of your bid goes to @budgets which funds growth projects for Steem like our top 25 posts on Steem! The other half helps holders of Steem power earn about 60% APR on a delegation to me! For help, will you please visit https://jerrybanfield.com/contact/ because I check my discord server daily? To learn more about Steem, will you please use http://steem.guide/ because this URL forwards to my most recently updated complete Steem tutorial? didn't know what is this, i'm going to check the post you linked, seems interesting! Good initiative to bring on new people while doing you passion. Good luck with it and continue your good work! Make sure to include the link to your post in the memo field of the transfer! Steem for the Steem throne!